Direct coupling of two molecules of nitrogen: chemists from Würzburg and Frankfurt have achieved what was thought to be impossible. This new reaction is reported in Science magazine and opens new possibilities for one of the most inert molecules on earth. Constituting over 78 % of the air we breathe, nitrogen is the element found the most often in its pure form on earth. The reason for the abundance of elemental nitrogen is the incredible stability and inertness of dinitrogen (N2), a molecule comprising two nitrogen atoms and the form in which most nitrogen exists. Only in very harsh environments, such as in the ionosphere, can dinitrogen be assembled into longer nitrogen chains, forming N4 ions with very short lifetimes. Despite the inertness of dinitrogen, nature is able to use it as an important feedstock for all kinds of living organisms. In biological systems, the very strong nitrogen-nitrogen bond in N2 can be cleaved and ammonia (NH3) can be produced, which then becomes the source of nitrogen for the entire food chain on Earth. Imitating nature, humans use the all-important Haber-Bosch process to break down nitrogen into ammonia, which can then be further processed to produce fertilizers and to make nitrogen available for the production of pigments, fuels, materials, pharmaceuticals and beyond. The production of compounds that contain chains of two, three or four nitrogen atoms – which are notably of pharmaceutical importance in vaso-dilating drugs, for example – requires the reassembly of mono-nitrogen molecules such as ammonia, because no direct reaction exists that can directly connect molecules of dinitrogen. This week, research teams from Germany, from Julius-Maximilians-Universität Würzburg (JMU) and Goethe University in Frankfurt, report a completely new chemical reaction in Science magazine. 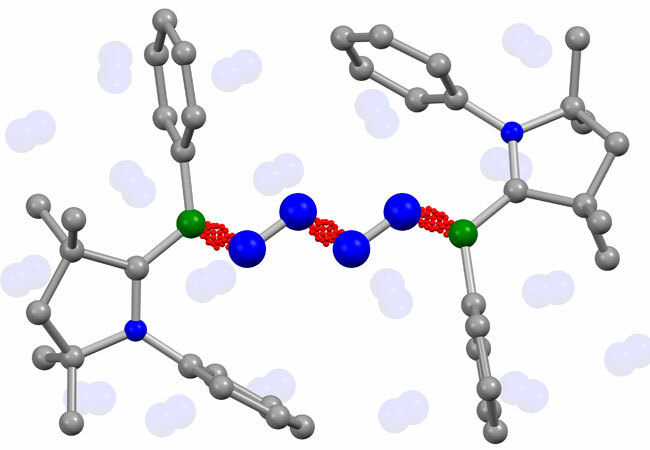 The new process uses boron-containing molecules to directly couple two molecules of N2 into a N4 chain. For the first time, they have succeeded in directly coupling two molecules of atmospheric nitrogen N2 with each other without first having to split the dinitrogen into ammonia, thus bypassing the Haber-Bosch process. This new method could enable the direct generation of longer nitrogen chains. The new synthesis pathway functions under very mild conditions: at minus 30 degrees Celsius and under a moderate pressure of nitrogen (around four atmospheres). It also does not require a transition metal catalyst, unlike almost all biological and industrial reactions of nitrogen. „This will open the way to a chemistry with which completely new chain-form nitrogen molecules can be synthesized,“ says JMU chemistry Professor Holger Braunschweig. For the first time, nitrogen chains containing a special variant of nitrogen (15N isotope) can also be easily produced. This scientific breakthrough is based on the experimental work of the JMU postdoc Dr. Marc-André Légaré and the doctoral candidate Maximilian Rang. Doctoral candidate Julia Schweizer and Professor Max Holthausen of Goethe University Frankfurt were responsible for the theoretical part of the work. They dealt with the question of how the four nitrogen atoms are chemically connected. „With the help of complex computer simulations, we were able to understand the unexpectedly complicated binding conditions in these beautiful molecules. This will enable us to predict the future stability of such nitrogen chains and support our experimental partners in the further development of their discovery,“ says the Frankfurt chemistry professor. The research teams have taken aim at incorporating the new nitrogen chain molecules into organic molecules that are relevant for medicine and pharmacy, especially enabling the production of their 15N analogues. The research into reactions of nitrogen was supported by the German Research Foundation (DFG). The team members Dr. Marc-André Légaré and Dr. Guillaume Bélanger-Chabot are funded by postdoctoral fellowships from the Natural Sciences and Engineering Research Council of Canada and the Alexander von Humboldt Foundation, respectively.